In this thesis, I study the differences in form and interpretation presented by event-denoting nominalizations. 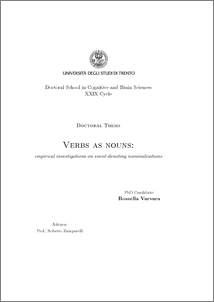 Frequently, languages have more than one type of event nominalization, such as deverbal nouns derived by means of suffixes (Italian mutamento / mutazione, ‘change’, ‘mutation’, or English assignment, explosion) and their corresponding verbal nouns, e.g. infinitives (il mutare, ‘the changing’) or gerunds (exploding). These are usually perceived as alternatives, since their semantic difference is not clearly understood by neither native speakers nor linguists. The aim of this work is to understand the rationale that leads us to choose one form instead of the other and to define the linguistic features involved. The hypothesis underlying the whole thesis is that different forms are never true synonyms and, thus, present some differences in use, distribution or meaning. In a first study, I explore the role of the base verb in the nominalization selection. I investigate if the various nominalizations are formed from different types of base verbs and which characteristics define their domain of application. By means of statistical modeling, I highlight how the transitivity of the base verb partially determines which nominalization is preferred. Moreover, I show that NIs are not used to make up for the lack of a corresponding EDN, refuting previous claims. Then, I move forward analyzing the cases in which both forms are derived from the same base and I try to understand if they differ in meaning. In the second study presented, I use collocation analysis to observe their semantic dissimilarities. With focus on a single syntactic pattern, I find out that nominal infinitives and deverbal nouns inherit only part of the base verb senses. The former usually prefer metaphorical and abstract senses, whereas the latter select more concrete and literal ones. Lastly, I use distributional semantic models to observe quantitatively the semantic shift of the two processes. I confirm the hypothesis that nominal infinitives are more transparent and more semantically regular than deverbal nouns, given their inflectional nature. The studies presented have been conducted on Italian and German; however, the findings are relevant for the general treatment of nominalizations and may be replicated for further languages. Overall, my work shows how quantitative analyses of corpus data can help us investigate problems that are hardly addressed by linguists introspection. Moreover, it includes in the study of nominalizations nominal infinitives, non-finite verbal forms which, contrary to English gerunds, have not received the attention they deserve.